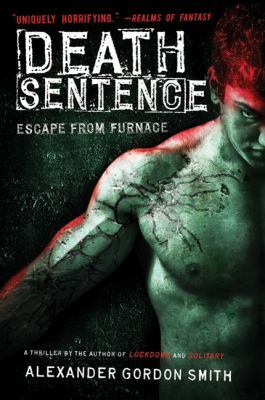 Just a quick note on Death Sentence: Book Three of Escape from Furnace. It still has the appeal of the first two books, but it does have that middle of the series lag, at least at the beginning of the book. It’s not so much that Smith is trying to go over what’s in the first two books–thankfully, he doesn’t fall into that trap. (Start at the beginning of the series if you want to know, right?) But he does begin with lots of gory details about Alex becoming a ‘Black Suit.’ The depth of this description will have appeal to many readers–it may hook some guys who don’t often choose, of their own free will, to read (teens whom libraries and schools call ‘reluctant readers’). The story does get moving along, and we reunite with Simon and Zee, have a great jailbreak scene, and more. So, if you enjoy the long descriptions of effluvia, stretched skin, painful procedures and an immoderate number of hallucinations, great. If not, it’s OK to give the first third of the book a cursory (quick, fast) read, skimming the pages. And then get down to the story. This entry was posted in Fiction, Hi-Low/Quick Read, Read 180, Sci-Fi/Futuristic, Young Adult Literature and tagged Escape from Furnace series, YA fiction, YA literature. Bookmark the permalink.